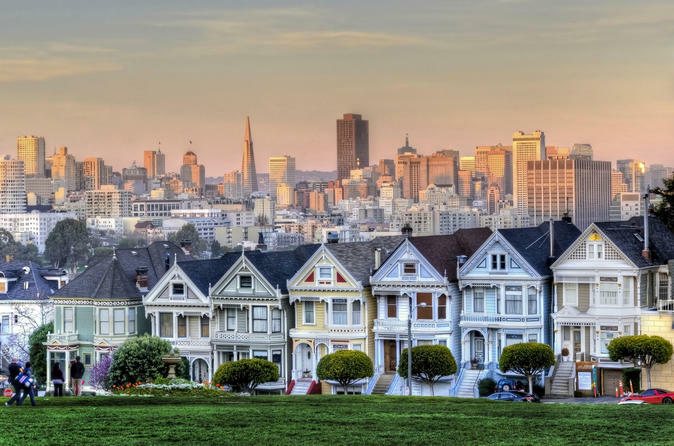 San Francisco has so much diversity, from the ethnic communities of Chinatown, North Beach and the Mission (where you can get the best food), to historic Fisherman’s Wharf and groovy Haight-Ashbury. See it all at a time and pace that suits you with the Walk On Walk Off Tour Pass: An innovative, affordable pass that lets you take 8 regularly departing tours without advance reservations. Just check which tours are running and show up at the meeting point 10 mins before start time. Choose to upgrade your pass to include an Alcatraz tour; San Francisco’s hottest ticket. Unlock San Francisco with this unlimited tour pass that entitles you to take 8 tours on a flexible schedule. Each tour is 60 to 90 minutes long and most run every day, giving you complete freedom to experience the city as you want. You can take them all in a few days or go at a leisurely pace. Just check the timetable and show up at the meeting point 10 minutes before the tour starts. If your plans change, it’s not a problem, the tour will run with or without you. Visit the pagodas of America’s most densely populated neighborhood in its oldest Chinatown; an incredibly authentic experience complete with fresh fortune cookies and mahjong in the park. Make a pilgrimage to the North Beach cafes where the Beat Generation (writers like Jack Kerouac) cut their teeth and the Italian community took root in San Francisco (and, perhaps more importantly, San Francisco's cuisine). Walk in the footsteps of Harvey Milk and other LGBT+ rights pioneers in the Castro. Take in the street art in the Mission, San Francisco's oldest neighborhood and home to Old Mission Dolores. Stand before the sweeping Golden Gate Bridge and learn about this iconic structure and those who built it. And don’t forget to save some time to soak of the hippie vibe that still infuses the Haight-Ashbury, home to musicians and dreamers. BOOKING NOTE: For those who add on Alcatraz tickets, the date you select here refers to the date you will take the Alcatraz tour. Please note that your Walk On Walk Off tour pass can be used any day before or after your Alcatraz tour. If you are not adding the Alcatraz tour, the date you select refers to the date you can begin using your Walk On Walk Off tour pass. WOWO Passes are valid for a full 7 days. Passes cannot be sold or transferred.